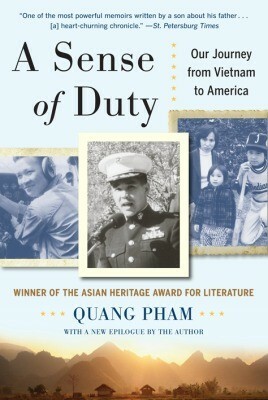 A memoir by a former Vietnamese refugee who became a U.S. Marine, Quang Pham's A Sense of Duty is an affecting story of fate, hope, and the aftermath of the most divisive war the United States has ever fought. Unfortunately, due to sales rights restrictions, we cannot offer A Sense Of Duty for sale in your country. A memoir by a former Vietnamese refugee who became a U.S. Marine, Quang Pham’s A Sense of Duty is an affecting story of fate, hope, and the aftermath of the most divisive war the United States has ever fought. This heartfelt salute to the spirit of America is also the account of the author’s reunion with his long-absent father, Hoa Pham, himself a devoted officer who saw combat firsthand as a South Vietnamese fighter pilot. Hoa’s revelations about his wartime experience leave Quang even more conflicted about his service in the Marines in the first Gulf War, and after years of struggling to reconnect with each other and the homeland they left behind, the two set out on a final, profound quest—to make sense of the war in Vietnam. Tracing Quang Pham’s uniquely spirited yet agonizing journey from his experiences as an uprooted refugee to his becoming a combat aviator, A Sense of Duty reveals the turmoil of a family torn apart and reunited by the fortunes of war. It is an American journey like no other.